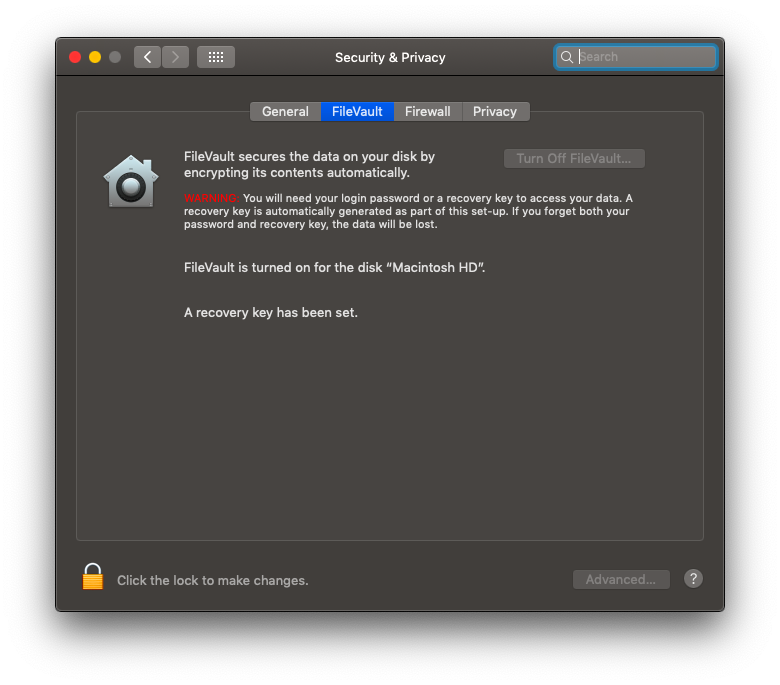 I'm trying to decrypt my disk and turn off FileVault, but I can't do that. 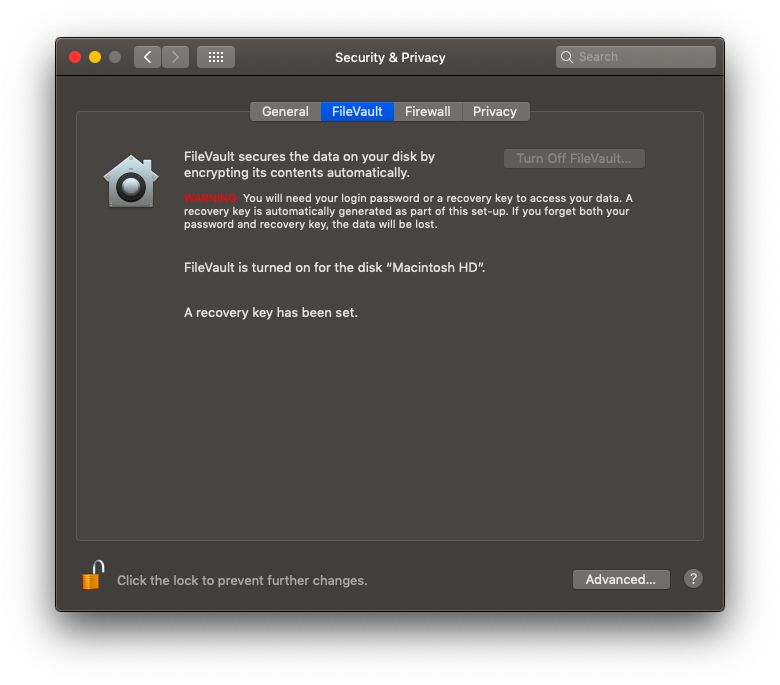 Firstly, the Turn Off FileVault... button is disabled. 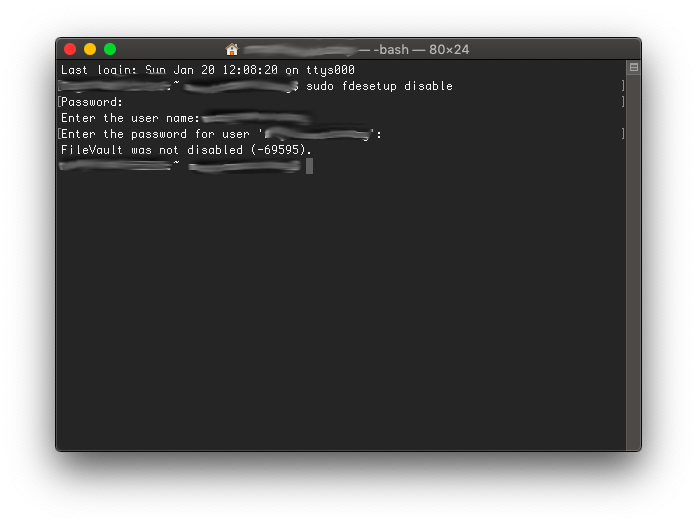 Secondly, I try sudo fdesetup disable with Terminal but it also doesn't work. It returns FileVault was not disabled (-69595). I'm running Mac OS Mojave (Version 10.14.1) on a MacBook Air 11" (Released in Mid 2013). Thanks! sudo diskutil cs decryptVolume -passphrase "YOUR_RECOVERY_KEY"
ongoing; you can check progress with `diskutil coreStorage list`. Boot into recovery mode by pressing cmd+R at starup. Open Disk Utility and unlock your partition. You can either use an enabled account password or the recovery key. Select the drive and press "First Aid"
Select the partition and press "First Aid"
If this fails, chances are pretty hight that something is broken in your partition and you will need to reformat the drive completely and restore your data. Not the answer you're looking for? Browse other questions tagged macos terminal mojave encryption filevault . My Password wasn't working, I had to hard reset the computer twice, what happened?